The Opposition in Parliament is plotting to pull the rug under the feet of the government by tabling its own Constitutional Amendments bill, the Leader of Opposition Betty Aol Ocan has revealed. 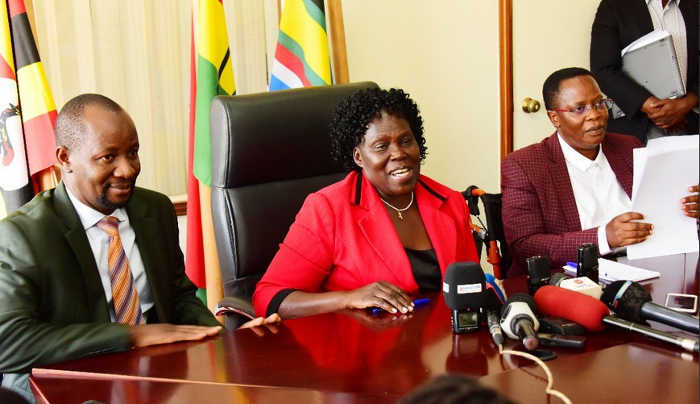 Ocan, franked by Kira Municipality MP Ssemujju Nganda and Mukono Municipality MP Betty Nambooze Bakireke, told a news conference that they are ready to table their Constitutional (Amendment) bill 2019. They revealed that some of their key proposals include the introduction of a Federal system of government, restricting the number of ministers to 21, and giving an-ex official status in Parliament to Presidential contestants who obtain more than 10% of the vote. The opposition proposes reinstating and entrenching presidential term limits. It is also proposing creation of speaker’s panel that will be advising the speaker’s office and preside over parliament in case speaker and deputy are not present. Others include having a vice president as a running mate to the president in elections and establishment of an independent Electoral commission. This comes as the Speaker of Parliament yesterday ordered the Minister of Justice and Constitutional Affairs Kahinda Otafiire to present the required electoral reforms before the end of April to give Parliament appropriate time to discuss them and be passed before the 2021 elections. Addressing the press on Wednesday at Parliament, the Leader of Opposition in Parliament Betty Aol Ocan noted that they have decided to unveil the reforms since government has remained adamant to presenting necessary bills containing the required electoral reforms as ordered by the supreme court and as demanded by the population. She asserts that as opposition, they cannot sit back and fold their hands as the current electoral commission prepare and serve the country another sham election. On Tuesday, the Minister for Justice and Constitutional Affairs Kahinda Otafire noted that his office will present the reforms after the constitution review commission has been instituted that will bring the views and ideas of all Ugandans which will form the prerequisite of the reforms. However the Speaker of Parliament Rebecca Kadaga asked the Minister to differentiate the Electoral reforms from the Constitutional review. In its ruling over the 2016 electoral petition filed by the former presidential candidate Amama Mbabazi, the Supreme court made recommendations relating to matters including unequal use of the state owned media, financial donations during the election period, involvement of public officers in political campaigns, use of technology among other as key issues in the electoral laws that should be considered for amendments to ensure a fair electoral process in Uganda. Now Parliament has given Otafiire up to end of April this year to present the amendment into the electoral reforms to give Members of parliament ample time to discuss them ahead of the 2021 general elections.